Large adrenal masses pose a diagnostic dilemma. 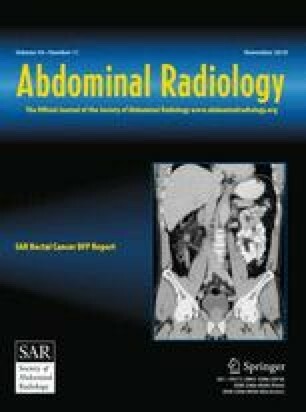 The purpose of this study was twofold: first, to assess the degree of interobserver agreement in evaluating the morphology of pathologically proven adrenal adenomas and adrenocortical carcinomas larger than 4 cm in diameter; and second, to identify morphologic characteristics that correlated with the pathologic diagnosis. For this blinded, retrospective study, we collected cases of 25 adrenal adenomas and 33 adrenocortical carcinomas measuring larger than 4 cm. Two radiologists evaluated morphologic characteristics of the lesions on CT. Interobserver agreement was evaluated using kappa statistics, and the correlation of imaging characteristics with the diagnosis was evaluated using a logistic regression model. We found the highest interobserver agreement in the assessment of precontrast attenuation (Κ = 0.81) as well as substantial agreement in determining the shape and the presence of calcifications (Κ = 0.69 and 0.74, respectively). Readers agreed less often regarding the presence of fat (Κ = 0.48), as well as regarding the presence of necrosis, heterogeneity, and the overall impression (Κ = 0.15, 0.24, and 0.26, respectively). CT characteristics correlated with benignity included round shape (p = 0.02), an overall radiologic impression of a benign lesion (p < 0.0001), the presence of fat (p = 0.01), and a precontrast attenuation of less than 10 Hounsfield units (p < 0.0001). The latter two of these characteristics were highly specific for benign pathology (93% and 100%, respectively). Our study suggests that CT has the ability to consistently identify characteristics significantly correlated with benign vs. malignant adrenal tumors.